Ever since I posted about celebrity closets last week, my own pathetic little closet has been seeming more and more inadequate. Luckily, it is the time of year where my closet makes the transition from my winter to summer wardrobes (there is only room enough for one or the other at a time- everything else goes in plastic bins under the bed), allowing me the opportunity for serious cleaning, organization, and fashion reassessment. 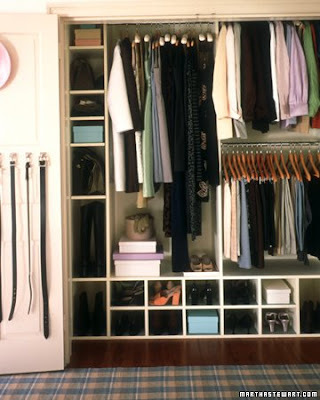 Here are Five Tips for your own closet clean-out. 1. Have a Fashion Show. Gather up a full-length mirror and a trusted friend, and try on every item in your closet that you have not worn in the last three months. Be realistic about trends and sizing- ask yourself, "how many times did I wear those pointy-toed, knee-high Robin Hood boots this winter?" and if the answer is um, none, it's probably time to get rid of them- it's going to be at least a few years before those suckers come back into style. And, unless you are currently making major lifestyle changes, you probably aren't going to lose 30 lbs before next winter. Why hang on to too-small things that make you feel bad about yourself? Make an effort to trim your wardrobe by at least as many items as you anticipate buying in the next season. 2. Give it Away, Now. One thing I loved about having roommates was the insta-clothing swap factor of all of us being able to shop among each other's hand-me-downs. Those days are gone (my husband doesn't wear my size), but that doesn't mean the spirit of the thing is: After I purge my closet, I always invite my girlfriends to look through the piles and see if there is anything they want. If you're more ambitious, you could organize a Clothing Swap Party, where you get the chance to pick through their cast-offs, too. Anything that's left over, I donate to charity (for those of you in Manhattan, the Housing Works thrift stores are a convenient and easy drop-off point), and take the tax deduction. 4. Get Sorted. I organize my clothes by color, because I think it's the easiest way for me to find things, but there are lots of ways to sort- by pants, dresses, shirts, etc., by outfits that "go together"- it's important for you to figure out what works for you, and then commit, and stick to it (no matter how tempted you are to just drop that jacket on the floor). 5. Store More. 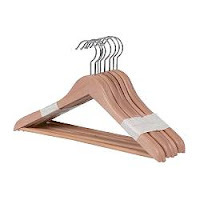 If you have a small closet, you can store all of your off-season clothes (winter sweaters, coats, etc. ), under your bed, or in the back of a storage closet. Just make sure you dry-clean or wash them before you put them away, as spots and spills that are almost invisible now can darken and become harder to get out over time (this is also a good litmus test- if you aren't willing to spend the time or money to clean the item, it probably isn't something you love, and you should get rid of it). 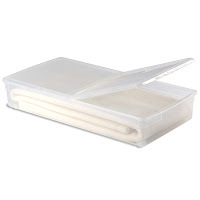 I fold things carefully into these plastic bins (Container Store Underbed Bins, $22.50), and stick a couple fancy french soaps in there with them, so my sweaters come out smelling fresh and sweet. At least, until October, when I repeat the whole process in the other direction.